The Alabama Political Reporter, LLC, just filed a Motion to Intervene and Unseal with the Alabama Supreme Court in Case No. 1150818, Ex parte Roy S. Moore (petition for relief case) seeking to have the entire record unsealed for public scrutiny. This motion was in response to Chief Justice Moore's statement, "I call upon the press to demand that the Alabama Supreme Court unseal Case No. 1150818 and, if necessary, to intervene in that case. The public has a right to know why I have requested that the justices, who participated in that case, be disqualified from playing any role in my appeal. The Court has refused my requests to unseal Case No. 1150818. 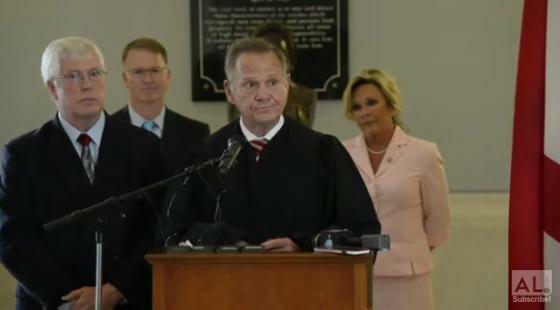 I ask the Supreme Court and the media to act," said Moore. I suspect that the Alabama Political Reporter is acting at the behest of Roy Moore. For all his bluster, Roy Moore is a coward. He does not want to risk sanctions by publicly criticizing his former colleagues at the Alabama Supreme Court. Nor does he want to antagonize any of the people who will be deciding his appeal. By getting a third party to request and then publish his legal criticisms, which are grounds for his request to recuse judges from deliberating his appeal, Moore has cleaner hands. At least that's the insane thinking by an irrational former jurist. Then one wonders what benefit Moore derives from airing his grievances in public. It appears unprofessional. Furthermore, things that seem perfectly intelligible to the psychotic Moore might make him look like a crackpot to the general public. After all, this is the guy who wrote that probate judges had a “ministerial duty” to deny marriage licenses to gay couples. Even in Alabama most people are generally sensible. John Stonestreet: "LGBT is not a Color"